Greetings. Today, 11/11/11, is my 2 year legiversary, and I have a chapter for you! I hope you enjoy! Comments can be left here or on the thread at Boolprop. Enjoy! I'm pretty sure I've read this when it came out, but I made a secret instead of commenting and then forgot to. Oops? I so want to shake James and tell him "NOOOOO!!!" with the whole stock market thing. It's like a historical horror movie where you know what is going to happen but the characters don't. What's interesting is that out of curiosity after I read your chapter the first time I dug out a few of my old history books to see if I could nail down what actually caused the crash. And I couldn't. But oi, the causes sure seem highly familiar and slightly scary if you are paying attention to financial things now. I was so glad to see you have a blond heir finally. So cute! I can get where Cindy doesn't feel like she can be a good mother, it's not something she really wanted and with her backstory it makes sense. Some people don't really bond with their kids until they get past the pooping in their shorts phase. I figured Cindy would come around eventually, especially since Nicky is beyond adorable. I am so glad that James and Marsha finally had it out. Marsha was becoming about as bad as her mother in law with all of her preaching and interfering. And we have Depression Sign! I look forward to seeing how this goes with the family. I also wonder if you're going to hit up on the Dust Bowl at all out west. So many things happened at this time. I look forward to seeing what you do with them. It’s hard to write stuff like the family investing in the stock market, because of the exact reason you mentioned. But the Bradfords were fairly affluent by that point, and that’s what the affluent did during that era. No one thought that anything would go wrong. Oh, how wrong they were. I did a lot of research myself about the causes as well, but no, there’s no way to pinpoint one specific thing that caused the crash. But yes, it’s oddly familiar to what’s going on in the current financial market. It’s nice to see the recessives that have been hiding come out to play, that’s for sure. Nicky is a cutie. I think Cindy was just on the extreme end of the fears that most expectant/new mothers feel (I can’t say for certain, since I’ve never been either), but I know that I don’t really get interested in my friends’ kids until they start to talk and show a little bit of personality. Cindy was always going to soften up towards the idea of kids, once she realized that her experience as a mother would be completely different from the once she saw her mother go through. It was nice to have James finally ‘fess up about how he was earning his money. Marsha has been getting a little preachy as of late, and she needed to be put in her place. But from what I found, many Prohibitionists were very much like her, in that they thought no booze was the only way. She is becoming a bit like Jan in some ways. Hopefully the Depression will force her to look at the big picture a little more and help her snap out of it. The Depression will certainly be interesting. There are a lot of things that I can pull for inspiration. I may mention the Dust Bowl in passing, as Alex’s descendants missed out it by moving back East, and it did affect the East coast by blotting out the sun during the winter. I think the crime wave and notorious criminals will play a role too. After all, James is involved with a lot of nefarious activities. As a whole, it was interesting reading this chapter, because so much of it came from myshuno prompts that I'd obviously already read. However, while that meant it wasn't strictly new, it was great to see them come to life, so to speak, with pictures and all. Yay new furniture! Boo for spending money! You can totally see them expecting prosperity to last forever here. Yay baby! And a boy and with recessives too! Makes things much easier for Cindy, not having to have more kids if she doesn't want, since they've got the heir, and, well, blond hair! Blond hair is cuteness! Oh, Cindy. :/ You're not broken, you're just taking some time to figure out your own life. Don't let Marsha get you down. See, Cindy is different from Jan - even though she thinks the garden is pointless, she's still willing to help with it it and not say that she thinks it's pointless because she's a genuinely good person. And, well, she'll see the use of a garden when it's the best way to feed them - there are good reasons to keep one going. Yay for James for letting Cindy do what she wants! If he wanted to, he almost certainly could stop her...but he's too nice a man for that. And good on him for sticking up for his wife to his mother. Yeah, Prohibition didn't really help all that much, did it? I'm glad James and Cindy are okay, but the shooting really would hit close to home. And there comes the Depression. At least they haven't lost everything - the house is theirs, free and clear, as is the furniture and such. Kids may have to wear hand-me-downs, and they'll have to grow some of their own food, but at least they can do all that. And neither Jefferson nor James has lost their jobs. So they're not great, but they're still okay. Can't wait to see this continue, and how they deal with everything! It was an odd chapter to write in some ways, because so much of it had been shared before. But I’m glad that you liked seeing how it all fit together, and the “illustrations” as well. It’s nice to bring the house forward a little more, and it’s even more fun because everything’s not quite so formal now. But yes, they’re acting like prosperity would last forever, because most people felt that way. There was nowhere to go up, right? Of course, with the hindsight we have, it does seem like an unnecessary extravagance, considering what’s coming. It was great that Cindy got a boy on the first try. And double yay for blond hair. No, she’s not broken, but living with someone like Marsha you can understand why she thinks she is. I love Marsha, but sometimes, she’s a bit much. That’s the great thing about Cindy – she does things she doesn’t like. Though she may not see the importance of the garden, she knows it’s important to Marsha (and she doesn’t want to upset Marsha any more than she obviously has). And yes, she’ll see the importance of the garden soon enough. James is a very modern man in some ways. Yes, if he had wanted to he could have stopped her and she’d have no recourse, but he is nice (in some ways). And yes, he does stand up for her, which is night. Nicky is very cute. I think it’s the hair. Yes, Cindy does take care of him (she’s not completely heartless), but she just didn’t feel the connection. But how could she not eventually, with all that cute? It was only a matter of time. No, Prohibition didn’t really do what people thought it would. There was a lot of violence as a result of it, and in the end it probably caused more harm than good (even the White House had a private wine cellar). But that will be coming to an end in the next chapter. Yes, James is an inherently good person. He may have the same number of nice points as Matthew, but his manifests as a quick temper. He wants to be a good man for his parents and his wife and son. Running a bar would be the perfect job for him, but you’re right in thinking the Depression is going to throw a wrench into his plans. In some ways, the Bradfords were luckier than others when the market crashed. The house and all its contents are theirs. They have food and means of getting more. James and Jefferson are still employed. Just remember that it’s still in the early stages, and the worst is yet to come. More babies! I can’t wait to see what they have. But if Nicky’s any indication, they’ll be adorable. I’m working on my inspiration, and am definitely looking forward to sharing how the Bradfords cope with the Depression. Hi! I'm finally caught up! I just want to say that I absolutely love your legacy and I'm sorry that it has taken me this long to read it! You have done a brilliant job of transitioning your family through various points in history over the generations and I can't wait to see what happens next! Your Civil War plot had me misty-eyed. I was simultaneously upset and relieved that more men made it home than I thought would end up doing so. I cheered when the women got the right to vote. I wanted to smack Matthew and Jan and was relieved to see them finally go. I wanted to hug Henri and adored Meadow and Philly's relationship. Great job on handling the Irish issues and I loved the side bit about pioneering. I was glad that they didn't seem to encounter too many difficulties on their wagon journey out there! And yay for the roaring 20s! I have been really enjoying James and Cindy! I like how you worked James' LTW to be a criminal mastermind with the speakeasies. The slang for this period is just too much fun as well. I'm glad Cindy got to keep her job as long as she wanted to. And yay for an heir with blond hair! I've read up on your restrictions for the Great Depression. Should be an interesting challenge. I was relieved that the Bradfords didn't lose everything. I'm sure they'll make it through okay if they are frugal. I'm looking forward to seeing what happens next (but am also sort of dreading WWII)! Great job! Hi Pen! Welcome. I’m always excited to get new readers, no matter when they jump into the story. It’s been fun and challenging to move the family through history. There’s only so much history I can include, and it’s hard sometimes to pick what I want to use. The Civil War was my first real plot, so I’m glad you like it. I’ll admit that I was too chicken to kill off more people than I did. Yay for the right to vote! Matthew and Jan were horrible, horrible people. Henri was definatelly a favorite of mine, and I really wish Meadow and Phily had lived in a different time, where they could have been together openly. As I’m of Irish decent, I had to tackle the issue. And as I said, I loved Little House on the Prarie, so I had to have someone go West. Alex and Katie had a pretty good life out in Simta Fe. I love the roaring 20s! James and Cindy have been fun to write. When James rolled criminal mastermind, I was bouncing in my chair, because that was what I’d been wanting for plot reasons. Cindy is the first woman to have a job, but she won’t be the last. Times are a changing! I’m far too excited to have an heir with blond hair. It’s nice to see some recessives after all those generations of brunets. It’s been quite fun to play with the restrictions, even if it hasn’t added as much of a challenge as I thought. But I still another rotation and a half to play with them, so it may get harder as I continue. 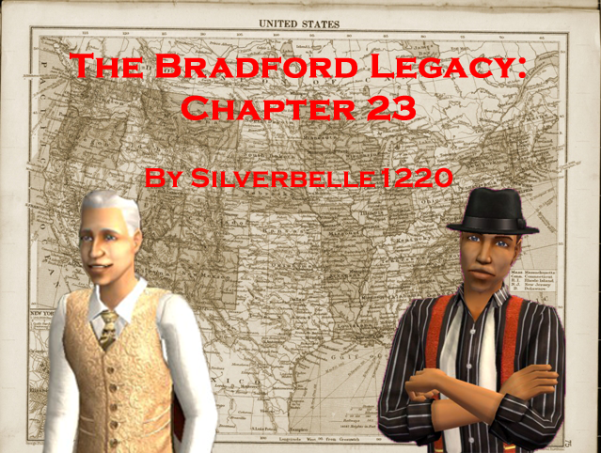 It is good that the Bradfords didn’t lose everything, but they’ll still have some challenges ahead of them. I’m working on writing up the last few scenes that I need for the next chapter so I can film them this week. I make no firm promises, but I’m hoping for a chapter soonish. Heh. I’m kind of dreading WWII myself. I’m decided I’m letting a randomizer decide everyone’s fates, otherwise I’d totally play favorites and that’s not fair. Keep your fingers crossed.